Surround yourself with the opulence and mystery of the Romanov dynasty with this intriguing historic novel! 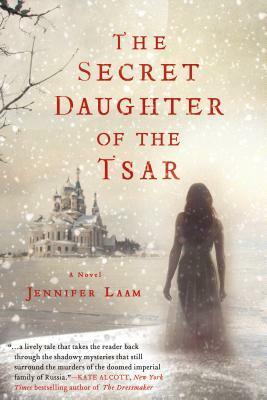 Thanks to the publisher, I am ecstatic to be able to offer a copy of The Secret Daughter of the Tsar by Jennifer Laam for your enjoyment! Winners will be announced 10/23/13. Thanks for the giveaway! I follow you on twitter and facebook, I also follow your blog and I shared about the giveaway on twitter and facebook. I hadn’t heard of this book, but now I want to read it! Thanks for the giveaway! Thanks for the giveaway! I’ve always been fascinated by the Romanovs. Thank you for the chance to win this book. I have shared on twitter, facebook and google +. Brilliant looking book, I’d very much like to win a copy. I am following, commenting, tweeting and blogging your post!! Thanks for the giveaway! My e-mail is grace (dot) troxel (at) gmail (dot) com, and I follow you on Twitter as @Bookwithoutpics. I also follow you through Bloglovin’. Hi everyone! I’m not entering the contest, but did want to say thank you for leaving such nice comments and supporting my book. Tomorrow is the big day and I’m excited. Thanks again! not sure original comment posted, so including it in this comment to let you know that @fentonslee teeeted this too.